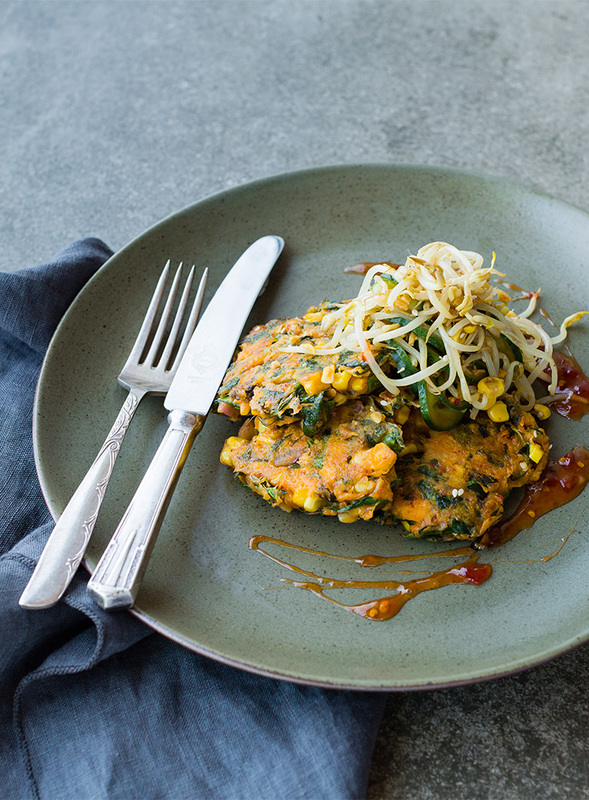 Fresh, clean flavours, as well as being speedy and easy to make, these Sweetcorn and Kimchi Fritters with a Mung Bean Salad is a real winner! Fresh, clean flavours, as well as being speedy and easy to make, it’s a winner! • Heat a fry-pan on medium-high heat. Drizzle corn cob with olive oil and season. Sear for 8-10 minutes, until charred and tender, turning occasionally. When cool enough to handle, stand corn cob on its end, on a chopping board and use a knife to slice down to remove kernels. Set aside and reserve pan. • Combine flour and baking powder together in a medium bowl, add milk and whisk into a smooth batter. Add half the cooked corn kernels (reserve other half) and all remaining fritter ingredients and mix to combine. • Heat a drizzle of oil in reserved pan on medium heat. Scoop 1/4 cup measures of fritter mix into the pan and cook, in batches, for 2-3 minutes each side, until golden brown and just cooked through. Set aside on paper towels, covered, to keep warm. • While fritters cook, combine all mung bean salad ingredients (except mung bean sprouts) in a small bowl and set aside. • Carefully wipe out pan with paper towels and return to medium heat with a drizzle of oil. Add mung beans and stir-fry for about 1 minute, until warmed through and starting to brown. Transfer to bowl with mung bean salad ingredients, along with reserved corn. Mix to combine and season to taste. • Place sweetcorn and kimchi fritters onto a plate and serve mung bean salad on the side. Drizzle with any excess dressing and dollop with sweet chilli sauce (if using).